COLUMBIA, Mo. – University of Missouri Chancellor R. Bowen Loftin and Commerce Bank Chairman Jim Schatz of Commerce Bank today awarded one of the 2015 William T. Kemper Fellowships for Teaching Excellence to Trista Strauch, an assistant teaching professor of animal sciences in the MU College of Agriculture, Food and Natural Resources. Loftin, Schatz and a group of professors, administrators and staff surprised Strauch by honoring her with the Fellowship, which includes a $10,000 check. 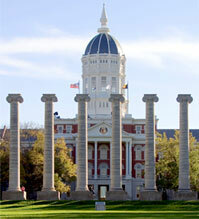 Kemper Fellowships are awarded to five outstanding teachers at the University of Missouri each year. This year is the 25th anniversary of the first William T. Kemper Fellowships for Teaching Excellence.